Students at Champlain Elementary School, in Burlington, and teacher librarian Susan Ames pose with copies of Lauren Wolk's "Beyond the Bright Sea." The students had questions for Wolk about the novel, a nominee for the Dorothy Canfield Fisher Book Award. Beyond the Bright Sea takes place in 1925 on a string of small islands called the Elizabeths, off the coast of Woods Hole, Massachusetts. The novel is a work of historical fiction, but it was mystery and suspense that grabbed — and held — the attention of a group of Dorothy's List readers at Burlington's Champlain Elementary School. Fourth-grader Elliot Throop: "Honestly, when I picked the book up I couldn’t put it back down." Fifth-grader Lisa Zhou-Hackett: "It was probably one of my favorites." And fifth-grader Marina Twohig: "There were all of these mysteries that … I feel like you should have solved before you got to the end of the book. And then, a few people I know that got some of those mysteries correct and guessed right … I think it was really fun trying to be the one trying to solve the mystery." Beyond the Bright Sea, by Newbery Honor author Lauren Wolk, is a nominee for the Dorothy Canfield Fisher Book Award, and the story features a narrator with an unusual name: Crow. The prologue explains that Crow was found in a boat as a baby by a man named Osh, who takes her in and raises her. 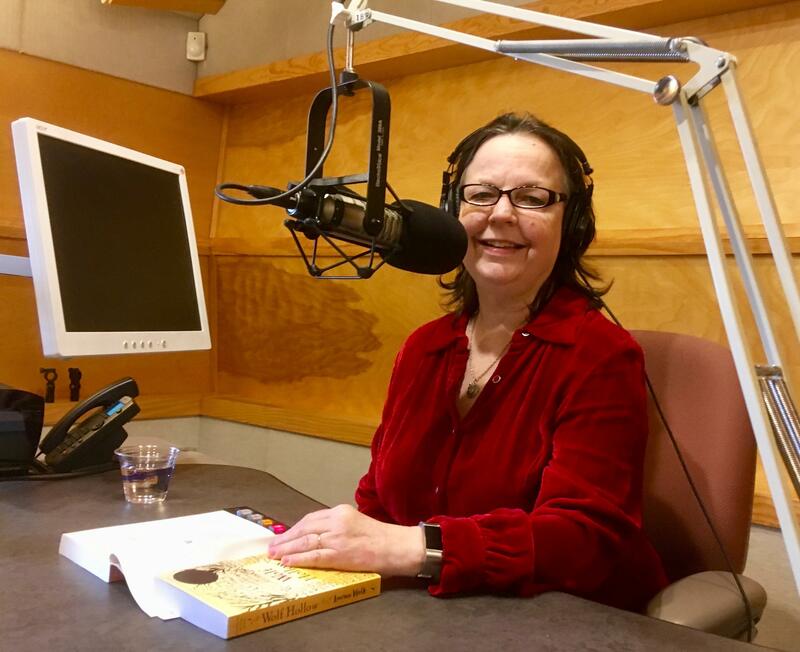 Listen to the audio above to hear Lauren Wolk read an excerpt from the novel's prologue. Near their cottage home is the island of Cuttyhunk, and nearly everyone in that small community keeps their distance from Crow — although she doesn’t understand why. Crow wants to find out where she came from and why she was shipped away when she was just hours old. She's also starting to wonder why she looks different from the people around her and just why everyone seems to be afraid of her. She thinks her answers may lie on Penikese, a nearby island with nothing but an abandoned hospital complex. These Champlain Elementary students gathered in the school's library were looking for some answers, too. They had a lot of questions for author Lauren Wolk about her writing process, the book and its memorable characters. Dorothy's List readers gathered around a table with teacher librarian Susan Ames at Champlain Elementary School to discuss "Beyond the Bright Sea" by Lauren Wolk. A fifth-grade student in the group was curious about the time period the novel is set in. Jesse Fitzgerald: "I was wondering why you chose to have this book take place in the 1920s." Lauren Wolk: "Jesse, that’s a great question and I wish I knew the answer, but I think I was born old. I’m really fascinated with things that happened long before my time. When I was a little kid, I would go with my mother to antique shops. I always wanted a spinning wheel or something for Christmas instead of a bike. … I love history. I love — I love the way people lived in a simpler time." And Wolk also said she wanted to set the book in a time and place where people relied heavily on the ocean. Lauren Wolk: "The ocean really lured me into this book. I live near the sea. It’s all around me so I really wanted to set this book … where the land and the ocean meet. And beyond that, I wanted it to be set in a time when people lived very close to nature – when the ocean for Crow and for Osh and the other characters in the book was like a member of their family, and where their very survival depended on … the relationship they had with the ocean. So, that’s what helped me to decide where and when to place the book." Oliver Nichols, left, and Jesse Fitzgerald during the discussion of "Beyond the Bright Sea" at Champlain Elementary, in Burlington. One fifth-grader was looking for a little advice on just how to start a story. Katie Sumner: "How did you know where to start the book? ... Every time, like, my teachers or something ask me like to write a book or something, I never know where to start. … It seemed like a really good place to start." Wolk said her process starts long before she writes her first sentence. Lauren Wolk: "For me, how I start really involves spending some time thinking — putting myself in the place where I want to set the book, living there in my mind, listening and watching. And when a character arises, like Crow did, and I see her — a baby in a little skiff on a beach, crying and crying until she’s hoarse and sounds like a crow — I am transported to that place. "The beginning of it is a single sentence. And it usually comes to me when I’m in the shower or gardening – never when I’m sitting at the computer, never when I have a pen in my hand. And that’s good. It comes to me when I’m just immersed in that world I’ve begun to create in my head. That first line just comes. And once it does, the second line comes a little easier. And after that, the third line. "Beyond the Bright Sea" author Lauren Wolk at WCAI in Woods Hole, Mass. "So for me, it’s not a matter of 'how am I gonna write 400 pages?' It’s a matter of 'what’s my first line?' And that’s like opening a door a crack. And then I push it further and further and further open, until I’m inside the story." Once she’s tackled the story's beginning, another fifth-grader wondered how the author proceeds. Lauren Wolk: "Wow Keats, that’s a great, great question — and I love the way you put it. You have a way with words. … So I really don’t want to know where I’m going when I begin. … It’s interesting the way you put the question, though. Things do loop back on themselves. "So when I notice something happening in a book – and often it’s a surprise to me – when I notice certain connections being made between the characters or certain patterns revealing themselves, I might decide to develop that, which means going back to the beginning and starting a little differently, revising the beginning so it leads into what I’ve encountered in the middle. It’s definitely not a linear process and it’s definitely not something I can predict. Or want to predict." Keats Overman-Smith, left, and Elliot Palm examine the cover of "Beyond the Bright Sea" by Lauren Wolk. The cover has the sun reflecting a feather shape in the water - and main character Crow has a feather-shaped birthmark. These readers at Champlain Elementary School were curious about some mysteries that were never revealed in the book. They wanted to know more about the characters’ backstories — their full names and where they came from. But Wolk said her knowledge is limited to that of her point-of-view character. Lauren Wolk: "When I write a book — well this is true of Beyond the Bright Sea at least, and my other book Wolf Hollow — I am writing in the first person, so I see the world through one set of eyes: Crow’s eyes. I experience everything in the book as she does. I can’t know what she doesn’t know. Which is really great because there are mysteries, even for me who wrote the book." That said, there is one character Wolk had to imagine a background for. In the book we learn that Osh, the man who rescues Crow as a newborn baby, has an accent. Before the book was published, the creators of the audiobook version wanted to know what kind of accent to give Osh. "So I told them what I thought, which was that he probably came from Eastern Europe, maybe the Ukraine. Because, at that time, the world was full of places — like the Ukraine, like Turkey — that were filled with strife and violence and discord and heartbreak. And so I imagined that he came from a place like that, and ended up … in [an] unlikely place – Cuttyhunk – because he sought refuge from that world. So, you’d have to ask Osh where he comes from, but I’m pretty sure it’s from that part of the world." Marina Twohig, left, and Lydia Allen listen in while their group discusses the novel "Beyond the Bright Sea," by Lauren Wolk, which Marina is holding here. And our last question comes from a fifth-grader who wants to know what may be next for this story. Siena DeMink: "Do you know if there’s gonna be a sequel or a movie?" Lauren Wolk: "I do plan to write a sequel. I think my next book — I have one coming out next year that is uninvolved with what I’ve written before — but after that I think I’m gonna write a sequel to Wolf Hollow. And after that perhaps a sequel to Beyond the Bright Sea because I want Crow to go on with her adventures. "There is talk of a movie, and the talks are progressing nicely. But I can’t say anything more about that right now, except that I hope that there is a film eventually. I think it would be a really exciting project to work on." Readers will have to wait for more details on those projects. Consider them another set of mysteries yet to be worked out. Special thanks to Champlain Elementary School teacher librarian Susan Ames. Next time we’re reading The First Rule of Punk by debut novelist Celia C. Pérez. Ask your librarian for a copy so you can read along. And find more episodes of Dorothy's List here. Mars is a very different place from Earth. But for Liam and his friend Phoebe, the main characters in the science fiction novel Last Day on Mars, the Earth colony on Mars is the only home they have ever known.